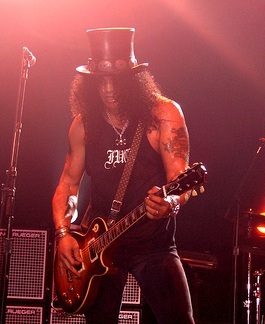 Others appearing later in the decade, such as Slash, took cues from earlier influences such as Jimmy Page and certainly AC/DC’s Angus Young. The wide open Gibson Les Paul sound that Slash used at times may have overshadowed his significant technical proficiency. His hard edge was also complimented by his knack for coming up with fluid, melodic lines such as the lead off riff of “Sweet Child ‘O Mine”. Van Halen’s work made such an impact that most, if not all, 80s rock guitarists seemed determined to demonstrate their best imitation of his style. Some managed to take that style in a new direction, though. One underrated and often overlooked example would be Reb Beach of Winger. Beach, who along with Winger bandmates suffered endless ridicule after unflattering references in MTV’s Beavis and Butthead series, is a talented axeman who took Eddie’s influence and added his own unique spin to it. Regardless, Van Halen’s work continues to stand on its own as the most significant display of guitar technique and inventiveness. Often overshadowed by his leads, his rhythm guitar work, ability to invent riffs, and unique tone (which was a result of his experimental tinkering with guitars, pickups and amps) were all also spectacular. Underrated axeman for new wave/rock pioneers The Cars, Easton’s tasty and inventive guitar parts played the perfect role in the keyboard/guitar fueled sound of the group. Easton brought rock, country and jazz influences to his parts, which always seem to somehow both fit in and stand out at the same time. The leader of blues/swing powerhouse Dire Straits who arrived in style with the 1979 track “Sultans Of Swing“, Knopfler took an MTV-ready turn with the crunchy “Money For Nothing”. The tune, which famously featured a cameo vocal from Sting, came off their great guitar-laden 1985 release Brothers In Arms and became a mega-hit for the group. As the twin guitar threat in 80s rockers Dokken, the two combined acoustic guitars with ripping solos from Lynch as in the example here. The group saw the most success with their 1984 debut album Tooth and Nail, which owed much of its sonic excellence to producer Roy Thomas Baker, who worked with Queen and The Cars. Playing guitar for Mötley Crüe was an exercise in survival with all the drug and alcohol-fueled antics of the band, but founding member Mars (who is also credited with coming up with the group’s name) wrote or co-wrote most of the band’s material and laid down some great fretwork that helped define 80s rock. For more from the 80s, check out these tracks and enjoy. Image credits: Eddie Van Halen “Frankenguitar”: Incase/flickr.com, Kirk Hammett: markwainwright/flickr.com, Slash: edvill/flickr.com, Alex Lifeson: ceedub13/flickr.com, Eddie Van Halen Carl Lender/flickr.com.